The DAADOO company offers, most of all, new leather upholstery for a car of any make and model. The new leather upholstery will change the interior of your car radically. Now you have the possibility of creating your individual design and style. Creating your car upholstery to fit your specifications will certainly be a guarantee of uniqueness, especially as you are not limited to several colours as in the case of a brand new car. A wide range of leather and thread colours, a variety of textures, the possibility of making elements with perforation as well as a number of finishes and adornments allow to create individual offer for a particular customer and his vehicle. 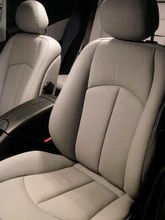 At the same time, there is a possibility of making car leather upholstery that is hardly distinguishable from the factory original, taking both look and quality into account. The upholstery is made from tried-and-tested car leathers which possess required certificates that approve their resistance to difficult conditions that can be found in a car. In total, the company offers leather in over two hundred colours and shades, all imported from Germany, Austria and Italy. These are leathers originally used by such producers as Mercedes, Audi, VW, BMW, Porsche, Bentley and Lamborghini. Apart from leather, the DAADOO company offers original alcantara (28 colours) with the option of applying perforation, if required.